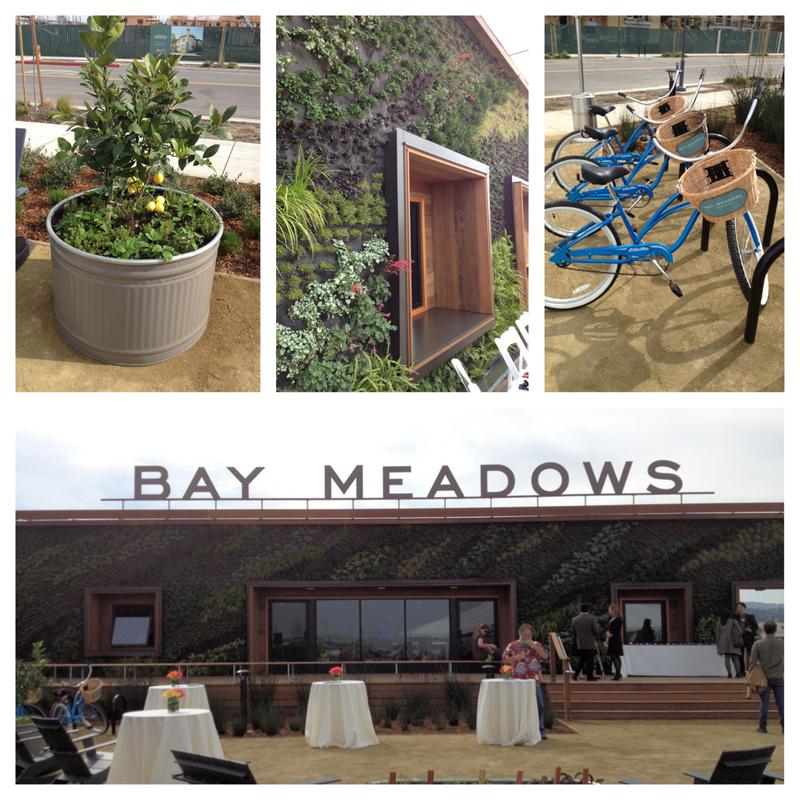 Bay Meadows, the new community going up in San Mateo on the old Bay Meadows Race Track, had a park dedication today and showcased it’s innovative living wall clad sales center, designed by BCV Architects, with a living wall by Habitat Horticulture, and grounds by CMG Landscape Architects and Star Apple Edible Gardens. 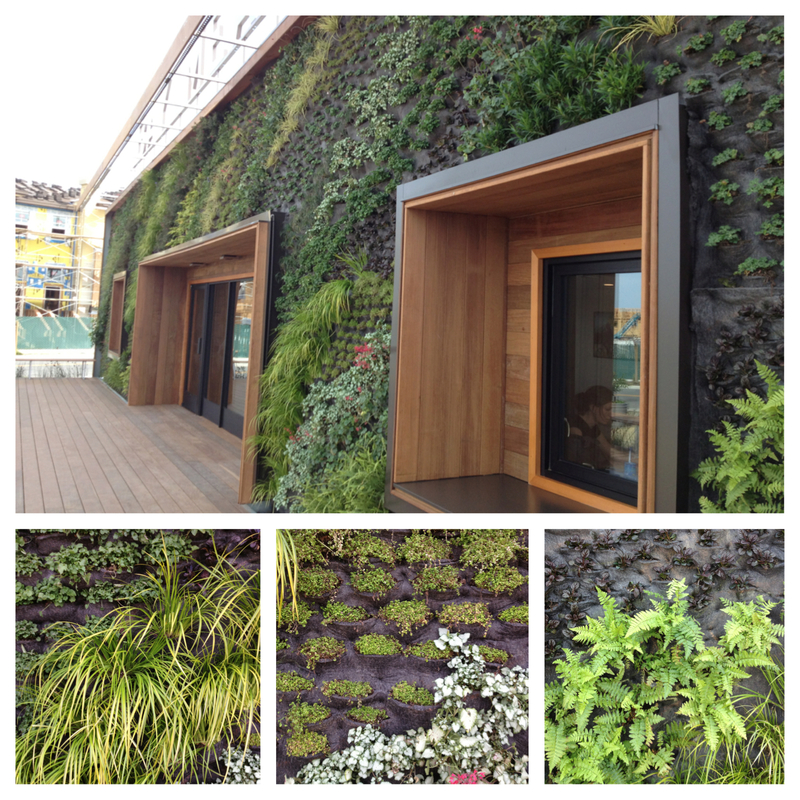 The living wall here is truly a living system, with felt supporting pockets of plants, and a drip irrigation system tucked in behind the felt. 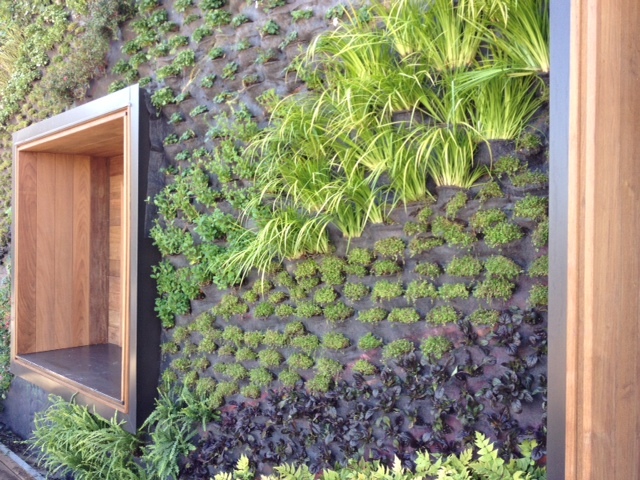 Also referred to as a green wall, or a vertical garden, this system will grow and over time knit together to create a varied and textured facade of plants. The outdoor deck and gardens of the center will provide future residents of Bay Meadows a place to meet adjacent to the park. A community garden designed and facilitated by Star Apple will be going in close by in the near future, adding to the communal outdoor space of the park and center grounds. Bikes are on hand to potential residents to tour the grounds. Galvanized tubs filled with edible plants flank the gravel seating area, thanks to Star Apple. David Brenner, founder of Habitat Horticulture, was installing the wall over the last week, and gave us a quick rundown of the process at a couple integral stages. Below is the video of this, where you can see the wall covered in felt, prior to the irrigation, pattern tracing and plants going in, along with an update at the halfway point in planting. David’s breakdown on creating a living wall. Some details of the finished wall. Very cool, I am proud to be a part of the sales team selling these homes for Tri Pointe Homes at Bay Meadows!